This was an actual Manila tour of Tutubi he "planned" for his Muslim guests recently which took them from Makati to Quiapo, Intramuros, Luneta and capped with Manila Bay Cruise all in a span of ten hours with little planning and decisions made on-the-fly, typical of Tutubi's spur-of-the-moment traveling style. The itinerary is, however, much too compressed, covered so much ground and ideal for travelers with only one day to spare, feel free to tweak to suit your preferences or just ask Tutubi. Note: Tutubi doesn't really prepare an travel itinerary as he likes the thrill of discoveries of unplanned travel brings. This was a Saturday which means generally lighter traffic in Metro Manila. Tutubi has a car that's why he's fast for he knows how to navigate the inner streets, where to pass by, mostly avoiding streets where jeepneys (one primary cause of traffic in Manila) don't pass. Take a taxi to exactly follow the route and for faster travel instead of the jeepney. The itinerary route is also possible via public transportation. 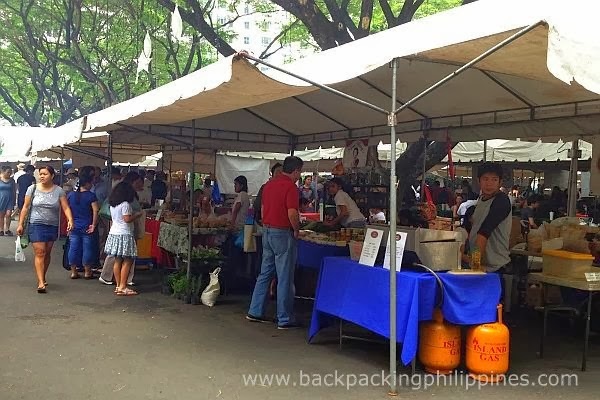 8:10 Had Breakfast and shopping at Salcedo Weekend Market in Salcedo Village, Makati. Tutubi bought his favorite budbud kabog, his guests looked for halal breakfast, settled for vegetarian samosa at a Persian/Indian restaurant plus all variants of budbud kabog and suman. 9:45 Arrived at Golden Mosque (Tutubi's first time to get inside the Quiapo landmark) on Globo de Oro Street corner Gunao. 10:00 Had brunch at a nearby halal eatery to sample mostly Maranao dishes (mostly yellow in color) fish with spicy coconut sauce and palapa and bodhi (fish roe) fulshed down with Maranao coffee. The neighboring streets of Globo de Oro, Norzagaray, Bautista, Elizondo and Gunao surrounding the Golden Mosque are lined with restaurants serving halal food for the Muslims living and doing business in the area, mostly Maranao and Tausug. You can even find Muslim "wares and wear"e.g. abaya, hijab, malong. 10:30 Took a padyak (human-powered tricycle or pedicab, fare: PhP10.00/person) to Quiapo Church after finding out the Lacson Underpass was closed for repairs). 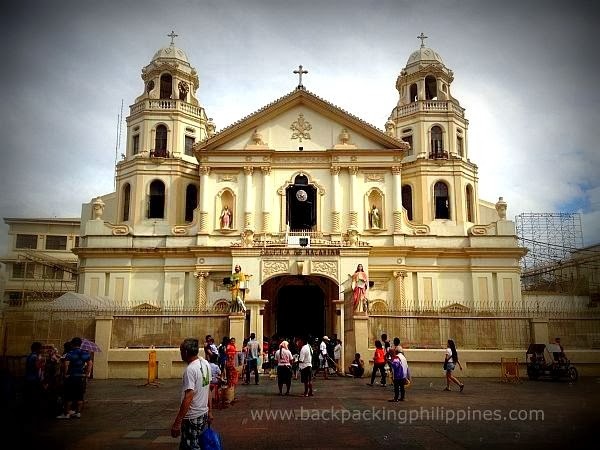 the well-loved Quiapo Church is the center of the Black Nazarene procession annually held on January 9 and attended by millions of barefoot devotees. Quiapo is the window to the soul of Manila and probably the Philippines. It's here where you can find Christians and Muslims living together in harmony, doing about business and daily grind. 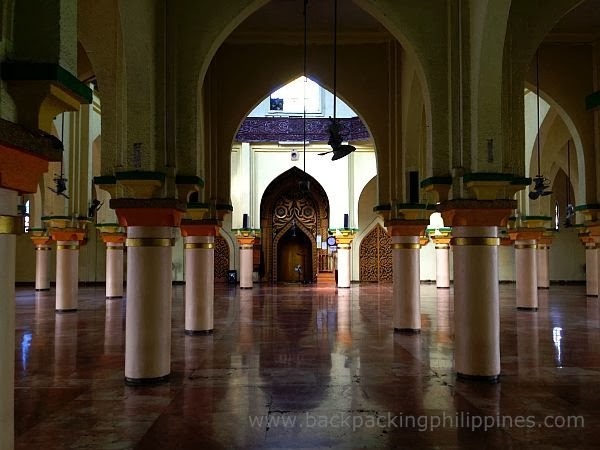 It's home to a famous Quiapo Church which is full of people on Fridays and also the Golden Mosque, where Muslims stop what they're doing to pray also on a Friday. It's also an area of ironies, where else can you find a Catholic Church surrounded by fortune tellers (manghuhula) and little stalls on the sidewalks selling herbal medicines (e.g. pito-pito, a concoction of seven herbs), amulets, anting-anting, katana (samurai swords), kris (Muslim royalty swords), balisong (butterfly knife) and the infamous pamparegla (sold in dark brown "lapad" bottles) which is a euphemism for abortifacient (abortion is illegal in the Philippines). It's also where you can find true Manila: gritty, grimy and non-pretentious. Fort Santiago, a Spanish fort near the mouth of Pasig River where once stood the palace Rajah Sulaiman, the Muslim ruler of Manila until the arrival of the Spaniards. The fort also once served as prison of Jose Rizal (the Philippine national hero, his last steps were imprinted on the road leading to Luneta (now Rizal Park) where he was executed by firing squad. There's also a bulwark facing Pasig River and a replica of Rizal's house in Calamba, Laguna serving as a museum. 11:30 Went out of Fort Santiago, looked around at a souvenir shop just outside Fort Santiago then proceeded to Plaza Roma in front of Manila Cathedral to look for a cochero and Intramuros Calesa Tour (calesa is a horse-drawn carriage) at a price of PhP350.00 for thirty minutes. 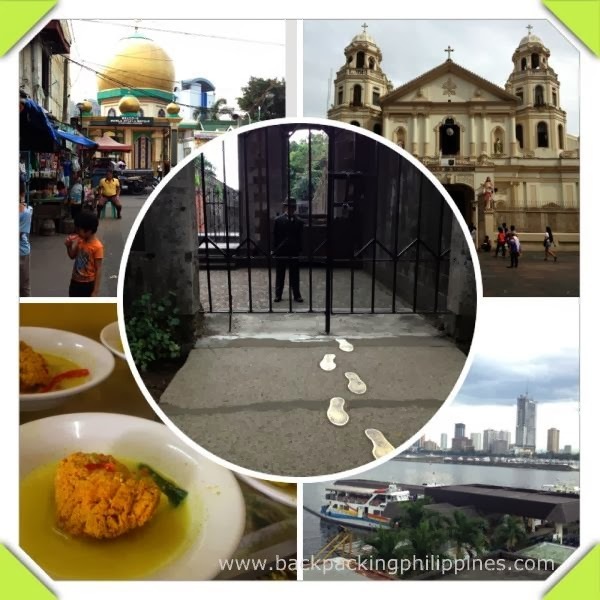 The calesa tour passed by these Intramuros landmarks: Manila Cathedral, Bahay Tsinoy (Filipino Chinese Museum), Memorare (Monument to the massacre during the Battle for Manila at the closing stage of World War II), Beaterio, Casa Manila (an old bahay na bato and museum, there's an entrance fee but Tutubi and his guests just requested the guard to enter the patio and take pictures), an old Japanese cannon seen from the walls, Pamantasan ng Lungsod ng Maynila (PLM), the the budget-friendly carinderias/eateries on the walls along Muralla with student patrons, Mapua Institute of Technology (MIT), Lyceum of the Philippines, Colegio de San Juan de Letran, the ruins of Interdencia then back to Manila Cathedral. 12:00 As it's lunch time, went to Shawarma Snack Center near Robinsons Place Malate on Salas Street. (Tutubi's guests were Muslims, that's why everything must be halal i.e. allowed to eat per the teachings of Islam). It's ironic that the restaurant ran out of shawarma, the only thing Tutubi wanted to eat there probably due to lunch time and he can't wait another 25 minutes for the next batch to be cooked, he ordered chicken tikka masala sandwich. 1:30pm Went to Rizal Park (Luneta) to see the Rizal Monument (near where Jose Rizal was shot and where his remains were buried permanently) and also the Kilometer Zero Marker (reference point of all kilometer markers all over the country). Also at Rizal Park is the Chinese Garden, Japanese Garden, Lapu-lapu monument, Quirino Grandstand and near it are Manila Ocean Park (oceanarium and other activities and shows for families, especially children), Museong Pambata (Children's Museum, the US Embassy, and Manila Hotel, Philippine Normal University, LRT UN Avenue Station, Planetarium, National Museum and National Art Gallery. Manila Bay Cruise is operated by Sun Cruises, the operator of Corregidor Island Tours, cruise time is around one hour which involves going south all the way to SM Mall of Asia then back. You need to book in advance for your seats unless you're lucky like Tutubi who was able to buy tickets walk-in. Recommend the 5pm cruise time slot for the sunset or the later 6pm slot during Saturday to see the SM Mall of Asia (MOA) fireworks. How to Get to CCP Complex from Quiapo or Rizal Park? Just take a jeepney with signboard Vito Cruz (preferably via Taft Avenue), alight at Vito Cruz and take the orange shuttle jeepneys plying the CCP COmplex Route.